Chilly winter or cold nights in the jungle presents numerous health challenges. Even in our houses, it may not be enough to rely on HVAC. No wonder most homes have at least a fireplace. What about making fire in a campsite or during an emergency situation. The needs of fire are limitless. However, one this is sure: You will need to fuel it to burn steadily and continuously. The obvious fuel choice is wood. You will need constant supply of wood. At the center of it all is the best splitting maul. 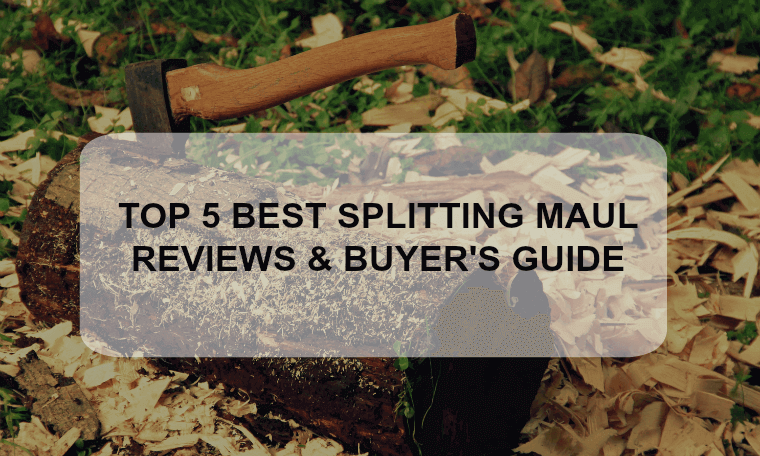 As mundane as it may sound, some people may not know what a splitting maul is. The fact that this tool has many names does not help either. 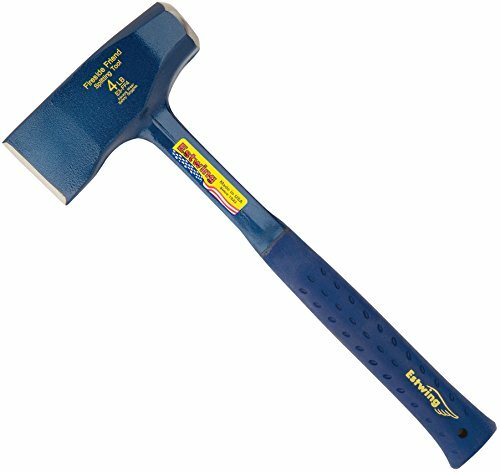 It may go by many other names including sledge axe, blockbuster, hamaxe, block splitter or go-devil. Regardless of what you would call it, a splitting is a type of heavy axe with long handle. It splits pieces of wood along their grains (inside of the wood). This is not to confuse a splitting maul with a regular axe, also known as splitting axe. A regular axe such as felling axe or clamp axe cuts pieces of wood against their grains. Thus an axe is what you will need to feel a tree by cutting into its bark. In terms of design, splitting mauls feature wedge-shaped heads and longer handles. In terms of usage, a maul swings downwards to split. But, a splitting axe swings across to fell a tree. Our number one top recommendation is the Fiskars Iso Core 8lb Maul. It features a versatile 2-face design that allows use as splitting and driving tool. Its anti-shock and anti-vibration capabilities make it ideal for both personal and professional use. Another feature of efficiency is handle flair which offers superior grip. Further protection is provided by Iso Core’s insulation sleeve. The sleeve captures shock before it can reach your hands. Iso Core delivers superior wood penetration. This is the work of its advanced blade geometry. That means you will split a wood with a single strike. Its 8-pound head features strong steel construction. The steel is coated to improve rust and corrosion resistance. Fiskars has high confidence in their models just like we do. They offer a lifetime warranty. Despite its great quality, the maul is extremely affordable. Thus it will give you value for your money. 2. Single-Piece Forging or Socket? 3. Is The Maul Balanced? The overall weight of a splitting maul has great bearing on its performance. Generally, heavier models are great performers. This is much of the splitting force comes from the weight of the head. Personally, I would go for maul heads weighing 8 pounds or more. The heavier the poundage, the more force you will be capable of bringing down onto the wood. The result is a faster splitting of logs. However, there is one drawback with heavier mauls. You will have to use extra effort with each swing. The result is that you will tire faster than you would with lighter models. The good news is that the effort is compensated for by faster splitting prospects. Lighter models will deliver less poundage. It will be difficult to split a log with a single strike. Thus you will do little in a long time. Base your choice on your physical strength. Choose heavier models if you have the physical strength handle them. When making a choice, keep other users in the back of your mind. It is better to buy a maul that anyone in the family (except kids) can use comfortably. Lighter models can function both as splitting axe and splitting maul. Inspect the way in which the handle mounts into the head. Is the socket strong and durable? The amount of time your maul will serve you depends on the quality of the mount. Some models feature single piece forging. This means no such sockets are necessary. This gives single-piece models excellent durability. There will be minimal chances of the head coming off the socket during use. Certain models feature wooden and metallic wedges. Good examples are those made of a steel-head and a wooden or plastic handle. These wedges help to fasten the handle to the head. The problem is that such sockets have the tendency failing with time. Imagine what would happen if the head comes off in the middle of a swing. Thus it would be better to go for mauls forged into single-piece. High-quality mauls should feel balanced when being used. They also provide good leverage for accurate strikes. How do you tell the balance of a maul you have not even used? Balance defines the way the head is weighted in relation to the handle length. It also depends on the overall design and shape of the tool. Splitting mauls with excellent balance are very easy to use. In fact, you may not need to employ any efforts to split wood. You simply lift the sledge axe. The swing will make use of kinetic energy (physical force) provided by the balanced design. .Yet, few manufacturers have achieved 100 percent balance. So it is your job to find out how a maul feels before you buy it. In case all components of the maul sit well when brought together, such unit will have good balance. You must know that well-balanced mauls usually need perfect craftsmanship. They are almost always handcrafted. Therefore, they may not necessarily be cheap. Find more about how balanced a particular maul is. Visit online shops and reviews from verified purchasers. In a hardware store, simply take the tool and try swinging it. The handle is the point of contact between you and your tool. It determines the grip, comfort, and ergonomics associated with using the maul. Traditional models of splitting mauls feature wooden handles. I bet you will agree that handles made from wood are comfortable and elegant. Today, manufacturers use fiberglass and other composite materials.You can read more about How to Replace a Splitting Maul/Axe Handle. Such materials are durable and lightweight. However, they may not deliver the same amount of comfort wooden handles provide. Very high-quality models with non-wood handles feature anti-shock and anti-vibration ergonomics. These features will make the mauls easier on your wrists when working. Grip is extremely important. Ignore it and you can suffer at the handles of your own maul. High-quality models add an anti-slip feature on the handle to prevent unnecessary slippage. Such features are easier to add on handles made of composite materials. Wooden handles are quite fixed. Choose composite material if you are going to use your maul extensively. It sounds funny but mauls with wooden handles are still the most expensive. The strength and splitting efficiency of any splitting maul depend on its wedge. A common misconception is that you do not need a sharp wedge to split wood. The fact is that a splitting maul must be sharp. But, it should not have fine edges seen with axes. When shopping for maul, check the edges of its wedge. It should be as sharp as possible. Wedge size is another important consideration. Large wedges will have higher penetrative force. This will make your work easier and faster. The surface of the wood a large wedge will hit is wide. Such mauls are also heavy. The combination of large, heavy and sharp-edge wedge deliver the best splitting efficiency. Unless you a millionaire, spending on anything is always a struggle between needs and savings. You have to face the fact that you must take the slightest opportunity to save. Does this mean you are doomed to only buy cheap stuff? By no means should you even consider this? Try to strike a balance between your budget and the quality of the maul you desire. Set aside the amount you are willing to spend. Then you can make your choice based on that budget. Sometimes it pays to buy a high-quality and costly stuff once and for all. A high-quality maul may be a little costly but it will give you years of reliable service. The Fiskars Iso Core is an 8-pound splitting maul with two-face design. It has a splitting face and a driving face. Fiskars is a household brand and one of the most famous. The brand has been providing the market with some of the best garden and outdoor tools. The first of Iso Core’s innovative technology is optimized blade geometry. The blade offers incredible penetrative power. Even the toughest logs will bow to its power. The maul boasts of Fiskars Iso Core shock system. The system allows the maul to absorb strike shock and vibration. The objective of this patented system is to minimize the beatings your body will have to take with each strike. Iso Core will transfer twice as less vibration and shock compared to other models. This will mean that you can split logs all day long without a problem. Another incredible feature that sets the Iso Core apart is the handle flair. The feature keeps the maul firmly in your hands while you swing. This means a lot to your safety. It will reduce the chances of accidental slippage that can lead to nasty injuries. To add to your comfort, the maul features an insulation sleeve. The sleeve stretches a few inches from the head. It serves to capture initial shock before it can reach your hands. To guarantee you years of reliable service, the maul features durable material. The construction material of the head is forged; heat-treated steel. The rust-resistant coating of the steel means the maul will remain looking new after years of use. To crown it, Fiskars show you confidence in the quality of Iso Core 8lb maul by offering a lifetime warranty. Actually, the maul is job site tested and approved before release to the market. Estwing Fireside Friend is a good alternative if for any reason you cannot buy the Iso Core. This 4-pound maul has advanced features that make it ideal for any homeowner or survivor. It presents a nice blue finish that masks its great quality and performance. The maul originates from America. It features premium steel forged into a single piece for unmatched durability. The lack of detachable parts is a blessing. It guarantees strength, durability and years of reliable performance. The maul features a nylon vinyl handle that provides excellent grip. The handle is extremely good in absorbing shock thus adding to comfort during use. It does this by reducing vibration due to impact by as much as 70 percent. Handling the maul is easy due to superior balance and temper. At 4-pounds, Estwing Fireside Friend is one of the lightest mauls. It can be used by almost anyone who knows how to split logs with a splitting maul. The maul features a rugged ballistic nylon sheath to ensure your safety. The tool has a tempered 2-3/8-inch cutting edge. This will penetrate through all types of wood, even the hardwoods, for easy cutting. It needs only minimal effort to split even wide logs. This will save you a lot of productive time. Husqvarna is a popular brand and for good reasons. They have not disappointed with their 32-inch wooden splitting maul. Permit me to say that this tool is crafted almost to perfection. From design to performance, this unit has an edge over other 32-inch mauls. The head weighs 6.5 pounds, 1.5 pounds shy of that of Iso Core by Fiskars. The heavy head and long handle give this maul superior balance. It has a double-faced head made of high-quality steel. There is a wedge face for splitting wood and a solid hammer for driving steel wedges. The feature gives the tool high levels of versatility. You can use the tool for more than splitting logs. The long handle is crafted from hardwood. Coupled with a glossy finish, the handle looks luxurious. The steel two-face head fits the handle perfectly through wood and steel wedges. This ensures the head strongly fits on the handle. Thus it will not detach despite extensive use. The maul will come with a nice leather sheath designed for its wedge. Such sheath protects the wedge from environmental elements. The result is years of service without corrosion or rusting. In case you love to split firewood in style then go for the Estwing 4-Pound Special Edition. With a 4-pound head and 14-inch handle, it is one of the most compact splitting mauls. The maul is so compact; you can even use it by a single hand. Similar to other Estwing mauls, this tool features single forged piece. The piece is made of strong and durable steel. Such design and construction material means the tool will take on tough woods but never bow. It features a weighted wedge design that will ease any chopping and splitting job. The wedge is very sharp and this will split all types of wood with a single strike. The other side of the face is a hammer for driving applications. These are features of versatility. You do not have to worry about discomfort during an extended splitting task. Estwing 4-Pound Special edition features a handle made from genuine stacked leather. For optimal wood penetration, the maul features a sharp and geometric cutting edge. Most wood will split with a single strike that is well-executed. The cutting-edge measures 2-3/8-inch. Its compact size means you can carry it easily without attracting undue attention. The Estwing Special Edition is one of the most affordable splitting mauls in the market. Truper 32415 may not match the quality and performance of the other splitting mauls we have reviews so far. However, it has salient features that set it apart as a great maul. Its strongest point is affordability. 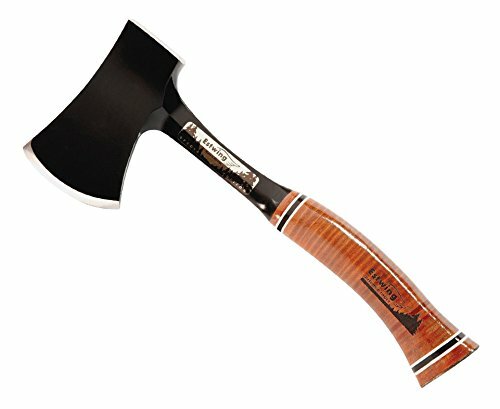 Are looking for a good quality sledge axe yet you have limited cash to spend? I bet Truper 32415 would be an ideal choice. The tool has a massive 12-pound head with 27-inches handle. The heaviness of the maul makes it ideal for splitting large diameter logs. The weight of the head also means most longs will come apart with a single, well-executed strike. The handle feature medium length stainless steel construction. The handle is rubber guarded to prevent unnecessary slippage during use. Besides excellent grip, the handle is comfortable and ergonomic. Handcrafting usually allow artists to pay attention to detail. Therefore, the results are always great quality. 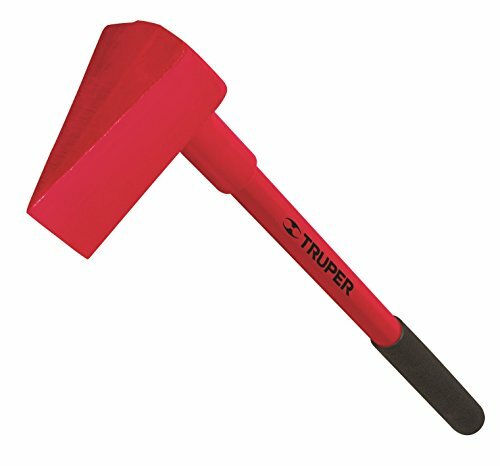 Truper 32145 is a handcrafted product of a Mexican company. Although made by hand, the maul features modern technology. The result is great balance and leverage. The technology ensures reliable performance of the maul in various applications. The combination of these features will guarantee you quick and efficient results. I know the information we provided you with is mouthful. Yet, it is what you need to make the right decision in finding the best splitting maul for your needs. Finding a high-quality splitting maul will guarantee you enough supply of firewood for any application. All the brands and models we have included in our review are tested for quality. Although they differ in quality and performance, we believe they are the best considering their prices. They will deliver performances only comparable to those of extremely expensive models. Now the ball is in your courts. To buy one, simply click the link provided. You will see for yourself why we consider them the best. You can even read real customer reviews to help you make an informed choice.